Whether packing lunches for your school age kids or making lunch at home for your little ones, the same three sandwiches day after day can give any parent the lunch box blues. Never fear, Happy Family has some great tips for fun, delicious and nutritious lunch options. Get Super Smart with Sides. Entice your picky eater with some creative sides. Try a rainbow of fruits and veggies: homemade hummus with red and yellow pepper strip dippers, colorful mixed fruit kabobs or grain salad with mixed veggies. 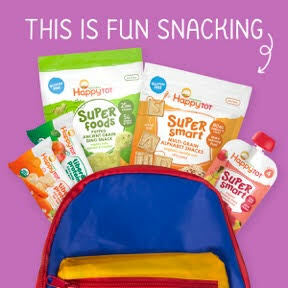 For a quick snack, try one of Happy Family’s new Super Smart pouches, perfect for toddlers with 20mg of DHA and 100mg of choline for brain development and eye health. Rethink Crunch. Skip the potato chips and pretzels and pack a punch of healthy crunch! Swap crunchy carrot sticks for pretzels, try your hand at homemade kale chips or toss a handful of banana chips on the side. Also try our puffed ancient grain Dino snack in kale, spinach and cheddar or tomato, basil, cheddar. These delightful dino-shaped snacks are packed with enlightened ingredients. Toss a handful on your salad as an alternative to croutons! Get Bowled Over. Making fun, nutritious combinations in a bowl can be pleasing to you and your little ones. One of our favorite recipes: Quinoa with Chicken and Mixed Vegetables. You can swamp out any ingredients—using what you have in your pantry and what works for your family’s food preferences. Your toddler can help pour and mix. The best part: this recipe is freezer friendly, so you can prep your bowl in advance and have at the ready at a moment’s notice! Make it a Wrap! Skip the boring bread, and wrap up a nutritious lunch instead! Grab your favorite whole grain tortilla and make wraps for lunch. Try combinations of fruit, vegetables and protein: cream cheese and bell peppers, chicken with salsa or sunflower seed butter, flaxseed and banana. The sky is the limit with a wrap! For your little ones, slice the wraps into pin wheels for fun easy, eating. End on a sweet note! We love using our products in fun ways—try out our Happy Pop popsicle recipes packed with super food nutrition and just the perfect hint of sweetness from organic fruits and vegetables. Looking for more creative lunch box ideas? Treat yourself to a copy of the brand-new Happy Family Organic Superfoods Cookbook for Baby & Toddler created for busy moms like you to give your family a happy, healthy start!